The knee is an important load-bearing joint of the lower limb. Knee x-rays are done to assess the knee joint pathology. Anteroposterior and lateral views of the knee are most common knee x-rays done. Skyline view is typically used to assess patellofemoral joint and patella-condylar alignment. Before we move towards normal knee x-rays, it is important that we acquaint ourselves with the anatomy of the knee. 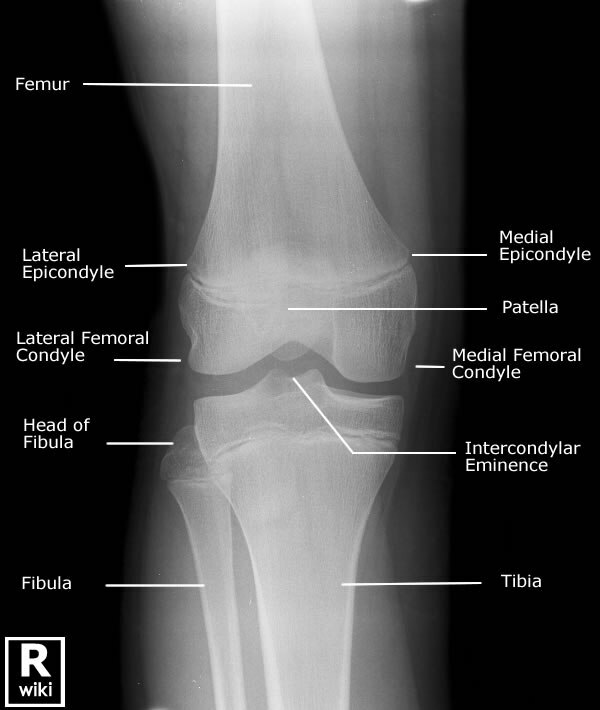 On x-rays, part of the knee joint are labeled. Here are the landmarks on ap and lateral views of x-ray. See also knee radiograph (an approach). – Age 55 or over. – Isolated tenderness of the patella (no bone tenderness of the knee other than the patella). – Tenderness at the head of the fibula. – Inability to flex to 90 degrees. – Inability to weight bear both immediately and in the casualty department (ie, 4 steps – unable to transfer weight twice onto each lower limb regardless of limping). Anteroposterior view is standard projection to assess the knee joint, distal femur, proximal tibia and fibula, and the patella. It is done with patient supine on the table with the knee and ankle joint in contact with the table [extended leg] and there is no rotation [external or internal]. For a Horizontal beam, lateral view crosstable view the affected knee is flexed slightly [about 30°]. The detector is placed against the medial side of the knee and the beam is perpendicular. The horizontal beam lateral view is the ideal projection to assess for in a joint effusion as in lipohemarthrosis , and requires little to no patient movement; hence, it is the lateral projection of choice for acute knee injuries. Roll over lateral view is done by turning the patient in a lateral position on the affected limb and flexing the knee while the beam comes from above. Skyline view of knee x-ray is done to assess the patellofemoral joint alignment. Skyline views are done by flexing the knee keeping the detector perpendicular to the long axis of the limb. When the beam is in superior-inferior direction, the detector is kept distal to knee [Merchant view]. When the beam is from inferior to superior, the detector is kept proximal to knee [Laurine view]. This is especially useful to assess the knee joint, distal femur, proximal tibia and fibula and the patella in load bearing situation. This view is often used to asses osteoarthritis, where often bilateral views are done it is not uncommon for the AP view to be bilateral knees. The maximum stresses in the knee joint occur between 30 and 60 degrees of flexion and therefore, standard anteroposterior weight-bearing radiographs on extension are not ideal for evaluation of cartilage loss. This view addresses this issue. The Rosenberg view is more sensitive and specific for joint space narrowing than the conventional extension weight-bearing anteroposterior views and is useful for the assessment of knees with early degenerative change. This view is often done in trauma and osteoarthritis to demonstrate intercondylar space. This view is done by flexing the knee to 45 to 50 degrees and beaming the rays from posterior to anterior direction. This x-ray demonstrates intercondylar fossa, femoral condyles, tibial plateaus, and the intercondylar eminence. It may show evidence of bony cartilaginous pathology, osteochondral defects, or narrowing of the joint space. The patella is rested on the superior portion of the image and superimposes on the distal femur. 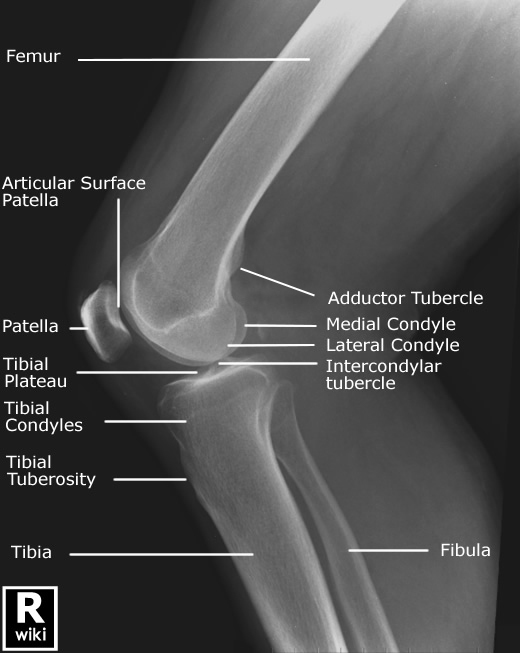 The medial condyle has a medial adductor tubercle [see above] whilst the lateral condyle has a lateral condylopatellar sulcus. [see below]. Their positions can guide about the rotation of the limb. The knee is generally considered to be in a true lateral position when the posterior aspects of the femoral condyles are superimposed. The lateral view shows the patellofemoral joint, joint space between the femoral condyles and the tibia. Usually, the knee is not flexed beyond thirty degrees. In a normal knee joint, the femoral and tibial outline is parallel to each other. When there is an injury or reduction of the space, the joint congruence is affected. Tibial plateau is carefully evaluated for any abnormality. B – Length of the patellar articular surface (see diagram). Normal value is around 1.25. The x-rays in children could be confusing because of the different stages of Ossification at different ages of life. Ossification of the femur, tibia, fibula, and patella is a process that starts in utero and continues through to the age of 18. The distal femur then begins to ossify at 3-6 months. At birth, the distal femoral epiphysis is in a transverse plane. Walking and other forces give it its undulating appearance. The distal femoral physis fuses at 14-16 years in girls and 16-18 years in boys. The patella begins to ossify at the age of 3-5 years. The patella has between 1-3 ossification centers. Accessory ossification centers are most common in the superolateral aspect of the patella. These accessory ossification centers are the cause of bipartite patella and may easily be confused for fractures or actual bipartite patella. The patella finally fuses in late adolescence. The fibula begins ossification in the 8th gestational week with 3 growth centers, one central and on at either end of the bone. The proximal epiphysis calcifies slightly later around 4 years of age. Closure of both the growth plates occurs in the early 20s.